My experience at the Vig Uptown made two things very clear. #2. I really needed a third adult in tow so me and the hubby could really take advantage of the endless mimosas. But I’m getting ahead of myself, and isn’t this really about the kids, anyway? We decided to make our after-church meal a brunch one recent Sunday and I’d heard someone say “The Vig” once, so that’s where we went. We got there about 11:30 a.m. or noon and the place was packed. In fact, we couldn’t get a parking spot in the restaurant’s lot, but my hubby was able to find one nearby. Back to the bottomless mimosas (at $15) – we passed because we knew we would probably have just one each and the server agreed that if we would likely order just one or two, it might not be worth it. If you prefer Bloody Marys, they had a pretty awesome Bloody Mary bar that includes everything from the traditional celery to bacon for just $4. As for the food, the kids’ menu was typical fare: mac and cheese, grilled cheese, chicken fingers, sliders and quesadillas. My kids got quesadillas and the sliders, which came on a nice buttery pretzel roll. 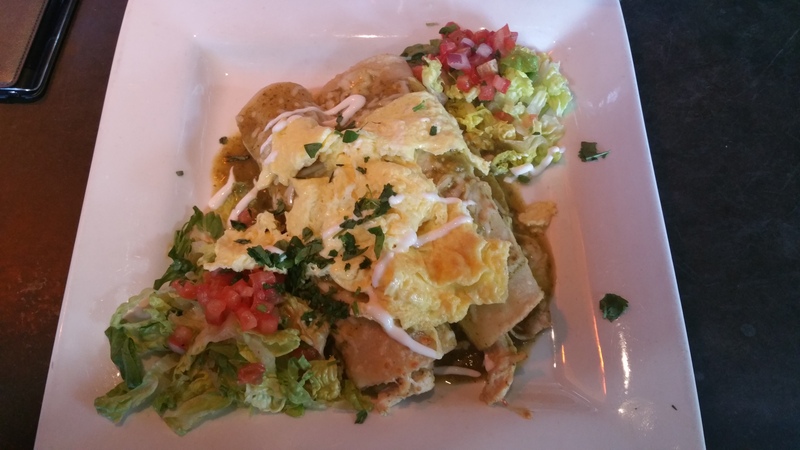 I got the Hangover Helper, a delicious version of chilaquiles, and my hubby got the Encanto enchiladas. 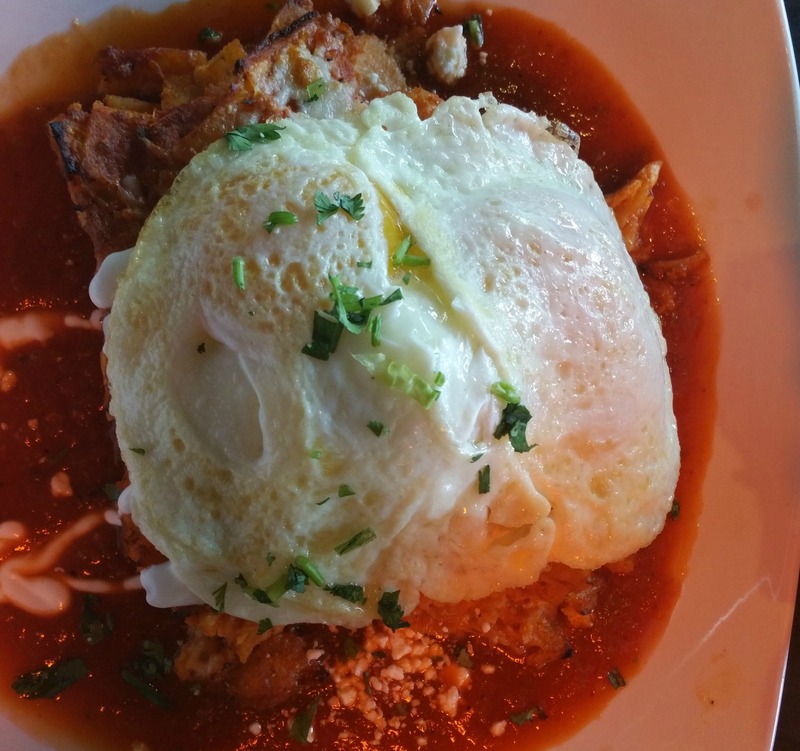 The Hangover Helper was a little more tomato-y and brothy than I would have liked ( I LOVE traditional chilaquiles), but the overal flavor was fine. Both kids drank milk, which added another $5 or so to the tab. Note: Even though they had a kids’ menu, drinks weren’t included. Bring the kids’ drinks or have them drink water.